Here are the most recent cumulative updates for SQL Server 2012, 2008 R2 and 2008. If you are on SQL Server 2012, both RTM and Service Pack 1 are still a “supported service pack”, but this will change pretty soon. I am also wondering roughly when SQL Server 2012 SP2 is going to be released. In the past, we have often seen public CTPs for SPs, but so far, I have not heard of one for SQL Server 2012 SP2. Despite this, I am thinking it should be pretty soon, probably before the end of 2013. I do think that the SQL Server 2012 code base has settled down quite a bit, since we are not typically seeing 40-50 hotfixes in every single CU. There were only four hot fixes in SQL Server 2012 RTM CU10, so that reinforces my opinion that SQL Server 2012 SP1 CU6 is where you should be now, especially since the RTM branch will be retired pretty soon. I really hope that Microsoft will choose to get the SQL Server 2012 SP1 and SP2 branches synchronized as far as CU release dates go. 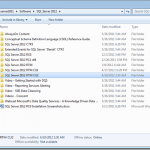 If you are on SQL Server 2008 R2, only Service Pack 2 is still a “supported service pack”. All other branches are retired. If you are on SQL Server 2008, only Service Pack 3 is still a “supported service pack”. All other branches are retired. I am still curious about whether there will be a SQL Server 2008 SP4 and/or a SQL Server 2008 R2 SP3 before both SQL Server 2008 and 2008 R2 fall out of mainstream support on July 8, 2014? Especially for people who don’t believe in deploying cumulative updates, the SQL Server 2008 SP3 RTM build and the SQL Server 2008 R2 SP2 RTM build are going to be quite ancient (and missing a lot of important fixes) by next July. So, to recap, if you are on SQL Server 2012, you should be on the SP1 branch by now (even though RTM is still supported). If you are on SQL Server 2008 R2, you should be on the SP2 branch, since SP1 and RTM are retired. If you are on SQL Server 2008, you should be on the SP3 branch, since all previous branches are retired. All of SQL Server 2005 is out of mainstream support, but if you are still on SQL Server 2005, you should be on SP4.